Secretion of hydrochloric acid diminishes with age, and older adults have low stomach acid. Hypochlorhydria and achlorhydria are associated with faulty digestion, impaired absorption of several vitamins and minerals, excessive absorption of food antigens, and disruptions of intestinal pH that unfavorably impact populations of gut flora. HCl-Pepsin provides betaine and glutamic hydrochloride which release hydrochloric acid at a rate which approximates that of normal physiological secretion. 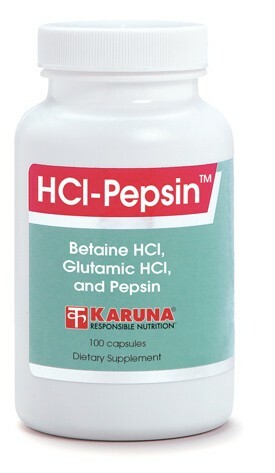 HCl-Pepsin contains betaine HCl and glutamic HCl which help acidify the gastric contents, creating a favorable environment for the proteolytic action of pepsin. Pepsin initiates protein digestion after a meal, facilitating the complete digestion and absorption of this important macronutrient. Suggested use for adults: One or more capsules, taken with meals, or as directed. Warning: patients with active peptic ulcer should use HCl products with caution.